A TRECUT O SAPTAMANA GREA PESTE FOTBALUL ROMANESC. ESENTA MOTIVARII CURTII DE APEL ESTE ACEEA CA, IN CAZUL DEZAFILIERII CRAIOVEI, NU S-A INCALCAT NICI O LEGE. STATUTELE SI REGULAMENTELE FEDERATIEI NU SUNT LEGI. DAR SE PARE CA ACTUALA CONDUCERE A FEDERATIEI DORESTE SI IMPLEMENTEAZA O * DEZVOLTARE PE MULTIPLE PALIERE*. DACA STATUTELE SI REGULAMENTELE SE POT INCALCA FARA CONSECINTE LEGALE, FEDERATIA ISI INCEARCA NOROCUL SI LA INCALCAREA PREVEDERILOR LEGALE DIN LEGEA 69/2000 LEGEA EDUCATIEI FIZICE SI SPORTULUI. 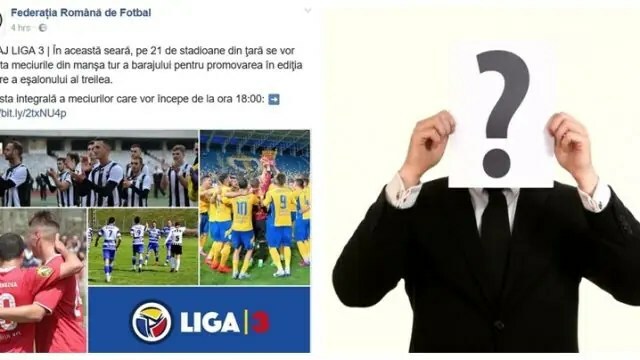 SI PRIMA OCAZIE A FOST PROGRAMAREA JOCURILOR DE BARAJ LIGA 3-A. AU FOST ACCEPTATE SI PROGRAMATE ECHIPE CU INCALCAREA GRAVA A PROPRIILOR REGULAMENTE SI ALE LEGII. FEDERATIA A FOST SESIZATA PRIN ADRESA ANEXATA MAI JOS. 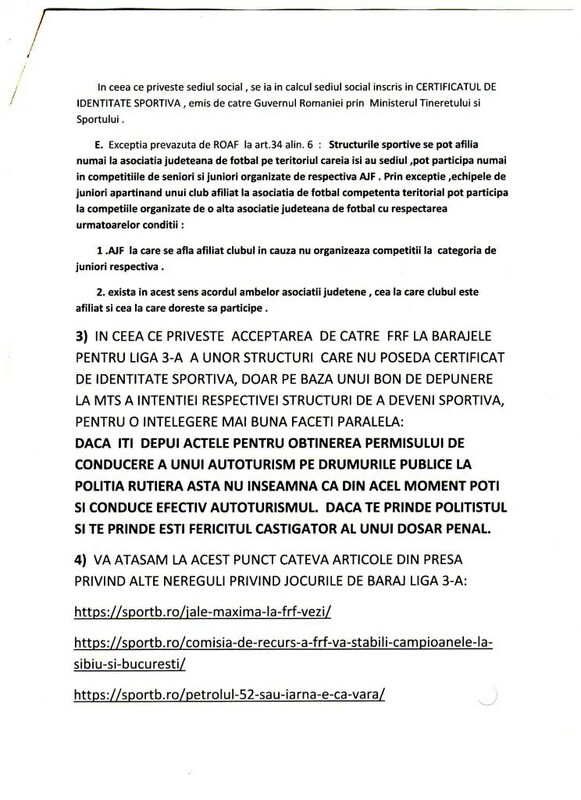 ENTITATIILE JURIDICE FARA CERTIFICAT DE IDENTITATE SPORTIVA NU SUNT STRUCTURI SPORTIVE SI NU AU DREPT DE PARTICIPARE IN NICI O COMPETITIE SPORTIVA DE PE TERITORIUL ROMANIEI. 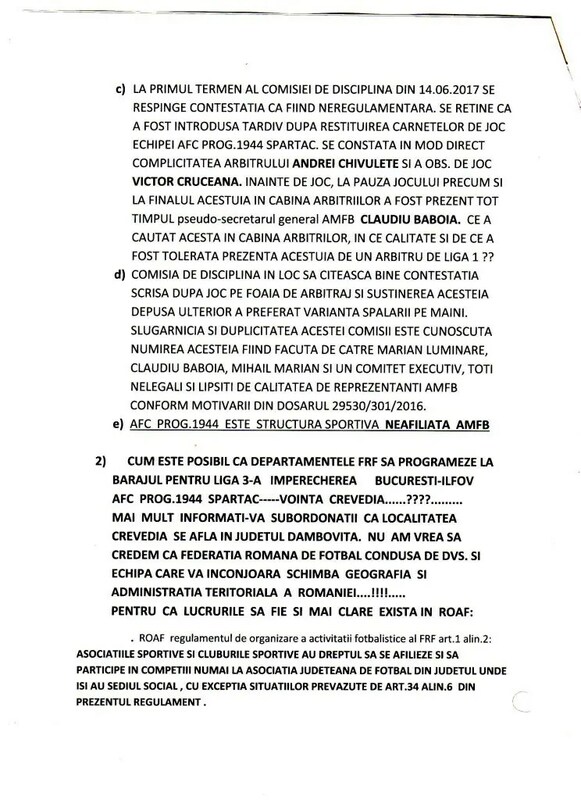 IN CEEA CE PRIVESTE PROGRAMAREA JOCURILOR DE BARAJ LIGA 3-A APRECIEM CA SITUATIA ESTE MAI GRAVA PRIN PRISMA FAPTULUI CA FEDERATIA INCASEAZA SI SUME DE BANI (BAREME DE ARBITRAJ, BAREME DE OBSERVARE, EVENTUALE AMENZI SI PENALITATI) . 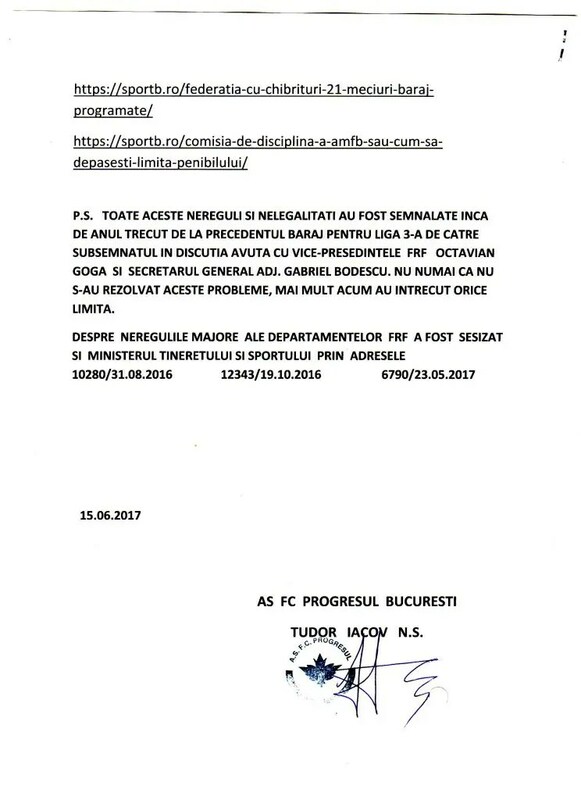 NU ERA SUFICIENT CA INCALCA ARTICOLE DIN LEGEA SPORTULUI, MAI OBTINE SI FOLOASE MATERIALE . 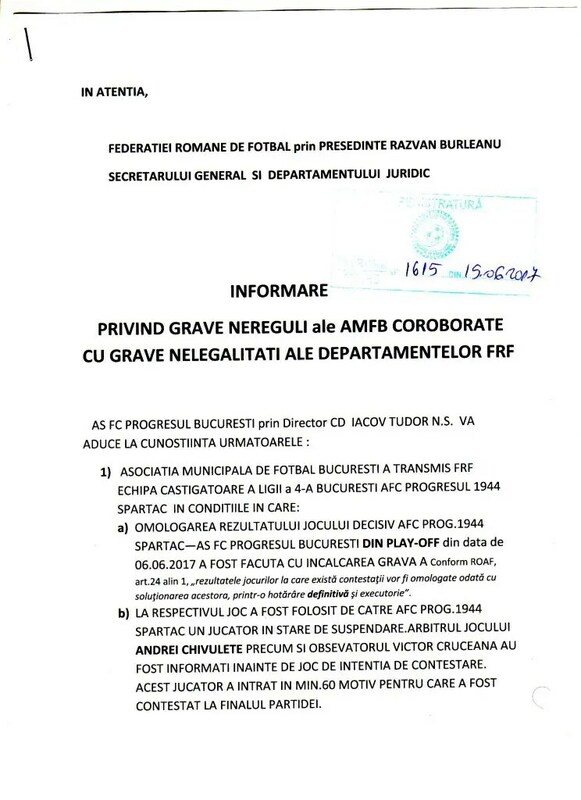 MAI MARII FEDERATIEI IN FRUNTE CU PRESEDINTELE RAZVAN BURLEANU SE LAMENTAU CA O EVENTUALA DECIZIE NEFAVORABILA A CURTII DE APEL IN CAZUL DEZAFILIERII CRAIOVEI AR DUCE LA FALIMENTUL FOTBALULUI ROMANESC. NU INSTANTELE JUDECATORESTI FALIMENTEAZA FOTBALUL. PRIN DECIZIILE CA CELE DE MAI SUS NOI CEI DIN FOTBAL IL FALIMENTAM. DEFINITIV SI IREVOCABIL.